Magic at Maths - Summer Term Pack. With this termly pack you will receive 12 weeks of activities. Each week there are 5 activities and you will receive all the activities for all 12 weeks upon purchase. Note these activities do not necessarily meet the additional demands of the new National Curriculum but still is a great resource for that little and often practice. Each activity has at least three questions to answer all displayed on the same page. 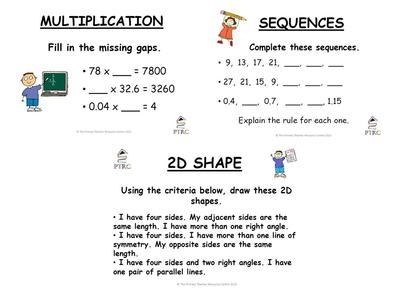 Therefore each page is only designed to take 5 minutes meaning these activities are perfect to complete at the beginning of a maths lesson, first thing in the morning or straight after lunch. Built up over the term it will really consolidate the mathematics skills of your class and is perfect for SATs revision.